Cost - you won't want to pay Â£1+ for a supermarket bag of 3-4 again once you realise how easy it is to grow them. Flavour - as with any home-grown produce, they will be better than anything you get from the supermarket. Satisfaction - the tangible joy of cutting a chili or two from your own plant immediately before adding it to your food instead of taking it from the packet in the fridge. You don't need many plants to be self-sufficient all year round, the first year I grew chilies I had them in the freezer until May the following year, just a couple of months before the next crop were ready, and I get through quite a lot! Sowing - use new seed compost (it makes a big difference, don't use multi-purpose compost) ideally in a propagator at 18-21C (65-70F), but in a warm position otherwise. They should be sown fairly early in the season in March, though February isn't too early as long as you are able to accommodate them once growing and keep them sheltered. They take quite a while to mature and start fruiting, it will happen if you sow them later but the productive season will be shorter. Cover the seeds very lightly (their own depth) with compost or vermiculite and provide light as this helps germination. Cover the pot or seed tray with cling film to keep the compost moist, the compost itself doesn't need to be very deep, 1" (2.5cm) max is fine as long as you prick them out fairly soon after germination which will take 7-21 days. 1st transplantation - Prick out the seedlings when they are big enough for you to handle into individual 3" (7.5cm) pots. Keep them in a bright frost-free place, a greenhouse or conservatory is ideal, early in the year excess heat will make them grow weak and spindly without the light to bring them on, so not a warm room. Final positions - Give them enough space so they get lots of light and make sure the leaves of adjacent plants don't over-lap. When they have filled the small pot (check under the pot for signs of emerging roots) they can be put into larger pots I use 2L or preferably 3L, though you can put three into a grow-bag. A thin cane for support helps here, tie the plant loosely to the cane. Chili plants like sheltered conditions more than they need loads of sunlight, sheltered and bright is better than not-sheltered and sunny. Of course sheltered and sunny is even better (though watch for overheating and scorching, especially when you first put them out). A sunny windowsill will suffice if it's all you've got and you'll get a reasonable crop of chillis from this position, though as the light only comes from one direction, it won't be as good as somewhere that the light comes from all directions. You may be able to grow them outdoors depending on where you live, if you do, then put them in the most sheltered bright spot you have. 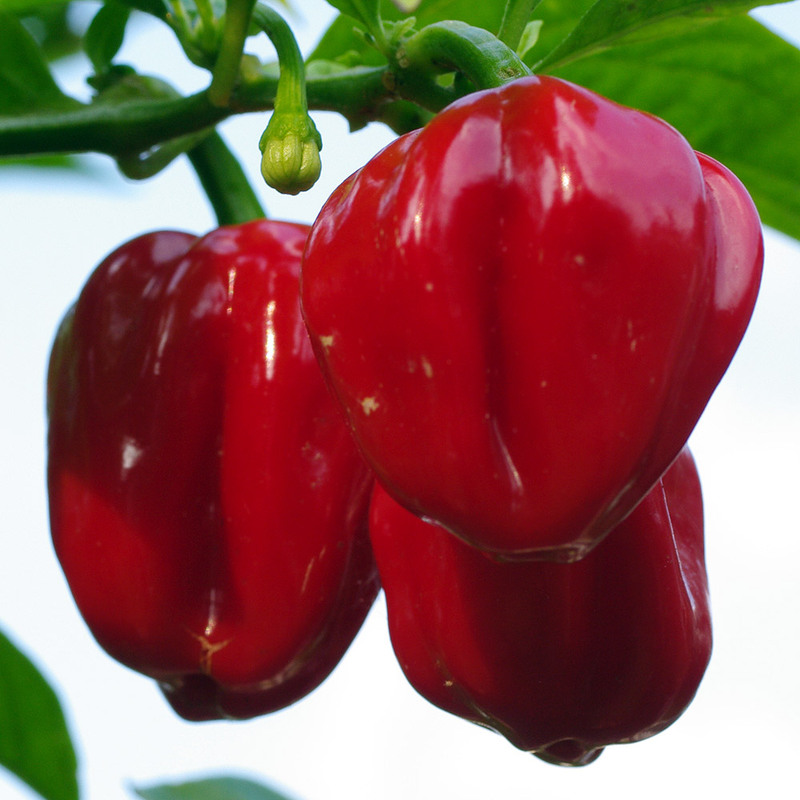 I've had them grow tall with loads of foliage outdoors (in Cambridgeshire) but hardly set any fruit, whereas under shelter with less light they don't grow as large but have lots of peppers. More recently I have grown them outdoors up against the house which they liked a lot. Feed them like you would tomato plants when they start to set fruit with a high potash fertiliser. They will start to fruit from mid-summer onwards and well into the autumn. Like sweet peppers there aren't really green and coloured varieties, the green ones are just unripe coloured ones. 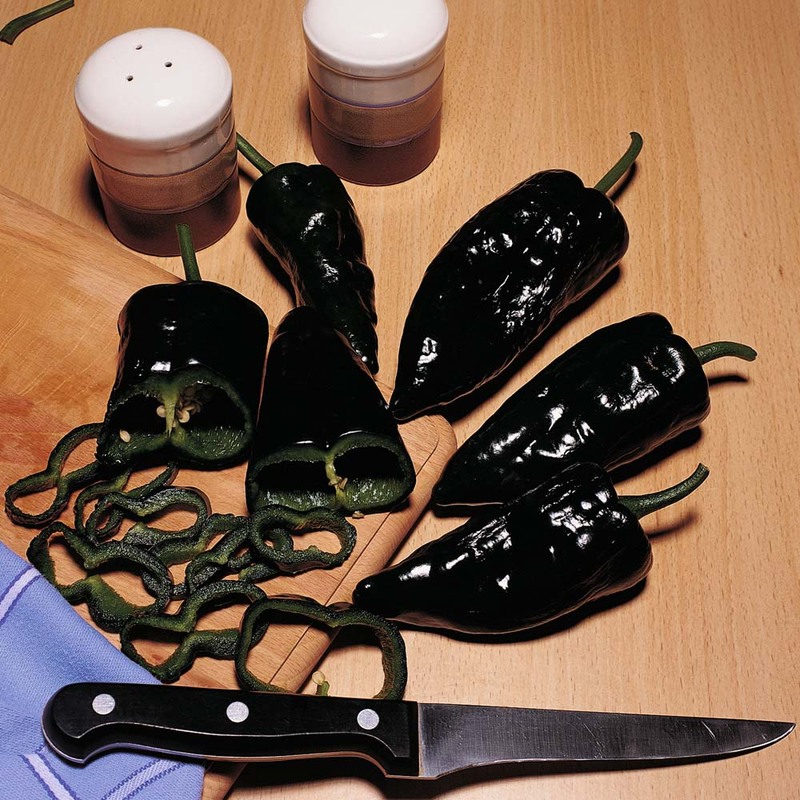 Storage - I like to leave the peppers on the plants until I need them and cut them for use, though even if you are moderately successful you will have more than you can use immediately. They can be left on the plants for a long time, I finally cut all mine off last year just before Christmas, they will start to shrivel and dry out eventually. On the other hand, cutting them when green or when just ripened will encourage the plant to make more chilies while leaving them on the plant slows production down. You could dry them but I find that freezing works better. Put them into a sealable plastic container and just take out what you need, they thaw quickly and are easier to cut than when dried. Drying is the traditional way of storing chilies and you will see many recipes (especially Mexican) that call specifically for dried chilies. I suspect the reason is of convenience rather than anything else. In a hot climate without refrigeration it works well and there really is no alternative. You can try drying easily enough, make sure the peppers are kept whole with a bit of stalk attached so that all the oils and flavours don't escape. Let them dry slowly and naturally on a sunny windowsill, don't chop them before storing them. Store them in an air tight jar or similar and ideally use within 6 or 12 months. Cut them up as needed from dry or soak them in water for 30 mins or so before using them. Overwintering the plants - Though they are often grown as half hardy annuals, chili plants are actually perennials and so can be overwintered successfully to grow again next season. They are very sensitive not only to frost, but also to cold temperatures. Keep your best flavoured and most productive plants at or above 7-8C ideally (5C might be ok, but be prepared to learn as you go!) a bright windowsill in a cool room if you don't have a frost-free greenhouse will do nicely. Keep them fairly dry but don't let them wilt and start to water them more when they start to show new growth which will start in late winter / early spring. Too much warmth with weak winter light will make them grow weak and leggy. I'm not claiming to be a cookery expert here, but I do have a life-long love of chilies and have consumed an awful lot over the last few decades, frequently on a daily basis. I find the best way to use them is fresh off the plant, next is out of the freezer and then coming up last is the array of sauces. Sauces however are very convenient and can be given away as gifts to chili-loving friends and family. I don't use dried chilies myself. Take care when chopping chilies, the scotch bonnets and habaneros I grow are often significantly hotter than any I've bought in a supermarket, if this is what you are used to, then go carefully at first until you know what you have. Don't touch your face with your hands after chopping them and be aware that the heat can stay on your fingers even after you've rinsed them under the tap. You could wear disposable gloves for this, I tend to go slowly and use another small knife and a fork so that I don't touch the chili any more than necessary, put the knife between the prongs of the fork when you've finished to wipe the pieces of chili stuck to it off and wash the chopping board before you forget about it. Touching the outside of the intact pepper is usually fine, but once cut, the heat is released from the oils. The hottest part is the placenta, the white or pale part inside the pepper that the seeds are attached to, the second hottest part are the seeds themselves. If you want the flavour of the pepper without all of the heat, you could discard these parts, though I suggest you keep them to one side so that you can add them later in case you want more heat after all. Cooking doesn't affect the heat of chilies, though it does help to spread the heat through the food and avoid biting on an uncomfortably hot piece. Add chilies right at the start of the cooking process so their flavour and heat can dissipate through the dish and avoid hot-spots. Chili con carne is always best prepared the day before then cooled and kept in the fridge over-night (add 3-4 pieces of dark chocolate to the pan at the end of cooking for extra depth and flavour) . If you do over-do it, drinking water won't help, though dairy does, drink milk or have something like an Indian raita or Mexican sour cream along with your chili containing dish, plain yogurt is also good too, these add an extra degree of creaminess that enhances the meal. 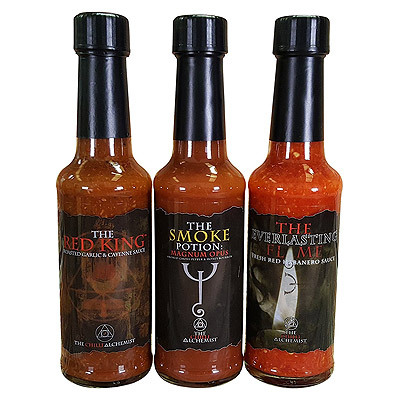 There are a million and one chili sauces available many with humorous and silly names and a it seems a bit of a cult for some that claim to cause actual pain on the way in or out where you need only the tiniest amount to make a dish almost indelibly powerful. I have yet to understand the point of these. 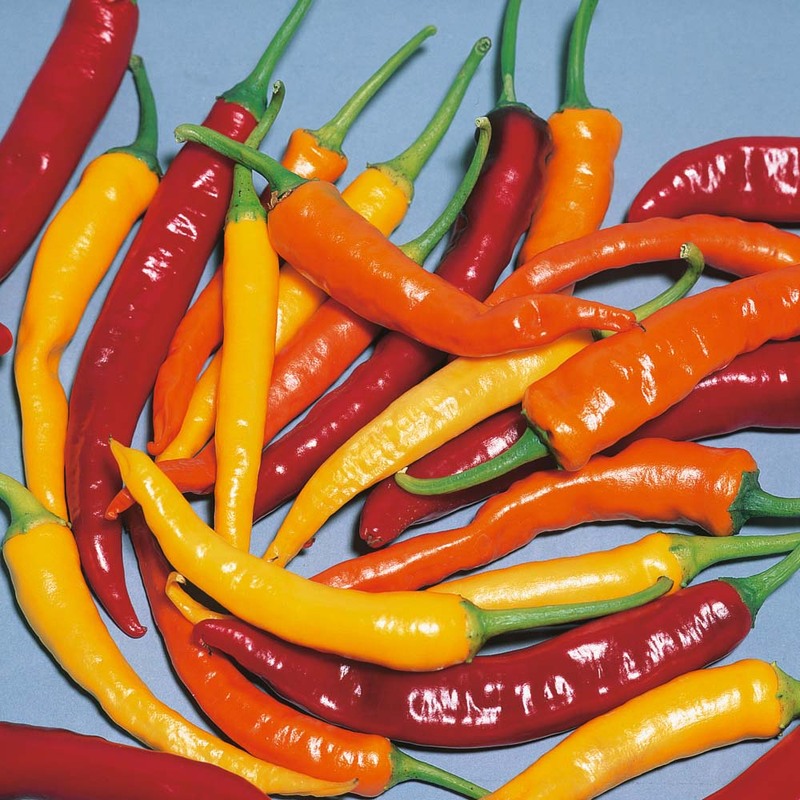 I use my chilies to make a a sweet sauce which can also be used for dipping and another hotter sauce that I use to add to things like cheese on toast, stir fry etc. 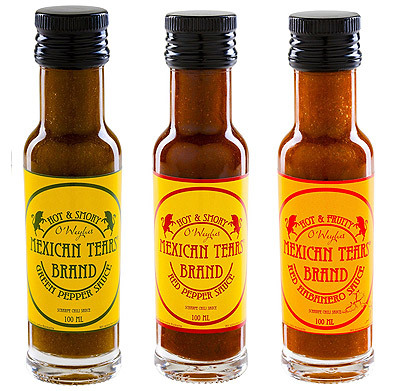 where chili heat and flavour is needed without too much taste from other ingredients. These two recipes are simple enough to make and work for me and the people I've given the sauces to. The most readily changeable ingredient is the amount of chili and type of chili. I suggest you make a small amount to start with and write down what you add so you know next time. It's not that difficult to make sauces that will be declared at least the equivalent of those you can buy. If you really want to impress you could even make your own labels. Sweet sauce / chili jam - this is Lorraine Pascal's recipe from her tv programme it worked well for me and there's lots of commentary on the web about how easy and successful it is for others. Blitz everything in a food processor then boil 25-30mins until the consistency is right, it may take longer. I use a blender I can use in the pan rather than a food processor, so let everything soften up a bit first in the pan and then blitz it. TIP - make a clingfilm tent over the pan with the blender in the middle to stop splashing and what can be quite an overwhelming smell of chilies. I use home-grown tomatoes when they are available so it can also be a very cheap recipe too, passata is good and makes a more even smooth sauce. If the sauce separates out in the jar somewhat, it won't harm it, just give it a shake before use. Chop the onion fairly finely, peel and chop the apple, add everything to a pan until it boils, blend together in the pan at this point and leave to simmer until it gets to the right consistency (20-40 mins) remember it will be thicker when cold than when hot. I avoided chopping the pile of very hot chilies by just adding them to the pan and letting the blender do its job (watch for splashes!). I used rice wine vinegar as it's what was in the cupboard, large relatively inexpensive bottles are available in many supermarkets "ethnic" foods aisle, otherwise white malt vinegar could be used. Varying the recipe - the apple in this basic recipe adds texture rather than flavour, I've also used mango pulp (from a can) and tamarind in the place of the apple, both of which worked really well. You can use almost any small glass bottles/jars that previously had sauces, jam etc. in, anything in the 200-400ml range is good as long as it still has a good airtight lid and is sterilizeable. Add the very hot sauce straight off the cooker into the hot sterile jars (a small funnel is invaluable here), seal and leave to cool. Use as soon as you can, keeping the jar in the fridge once opened. I've no idea how long it lasts other than at least 3 months which is as long as any has lasted so far before being eaten. Chilies belong to the genus Capsicum which gives the chemical its name. Like lots of plant chemicals that we find tasty, it is actually produced as a deterrent against organisms that may eat the plant, particularly fungi and insects. Birds spread the seeds of chilies, they pass through their digestive system intact and therefore viable, mammals often have teeth that crush and so destroy the seeds, so it makes sense for the plant to be palatable to animals that will aid its spread. 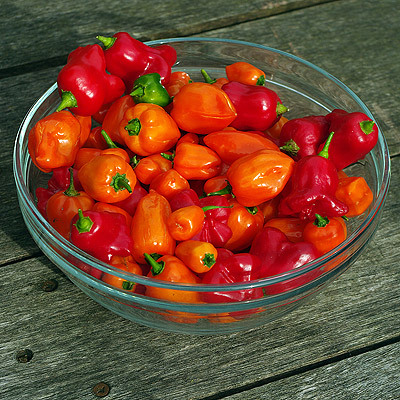 Capsicum seeds are predominantly spread by birds.